Notes from a Children's Librarian: Get Kids Writing! Inspiring kids in the primary grades (kindergarten included) to get writing is easy with these literary gems. 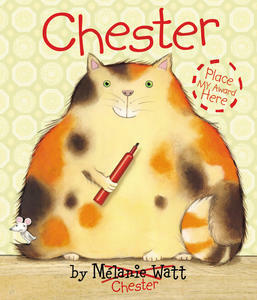 Chester, by Melanie Watt, is the first in a trilogy for a sophisticated young reader. A power struggle between author and character takes the plot hostage. Chester, the cat, trumps Watt's mouse-story by attacking the mouse's happy home, substituting mouse pictures and cheese for cat pics and fish snacks. Watt fights back (her story is in black font as opposed to Chester's red scrawl) with a scary bulldog, and a downpour of rain, which smudges Chester's version of the story. Watt gets the final word by drawing the humiliated cat wearing a cinch-waisted tutu. 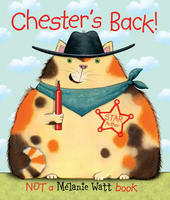 The feud ramps up in the sequel, Chester's Back!, with Chester graffiti-ing Watt's author photo. The author counters with open auditions for Chester's replacement. The cat's egomaniacal needs are finally satisfied (or so he thinks) when Watt makes him a star, but not the kind of star he intended. The final book, Chester's Masterpiece, addresses how to construct a story. Chester's red pen completely takes over, right down to the bibliographic data. Watt's comments are relegated to post-it notes demanding Chester plan his story, addressing genre, setting, villain (Dr. Mean Mouse) and alternate endings. Chester runs out of ink but he definitely gets the last laugh. Very advanced humour. 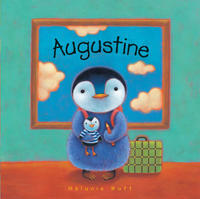 Augustine, also by Melanie Watt, motivates young readers to draw their story. Augustine the penguin is a lover of all things art. He moves from the South Pole to the North Pole and nervously faces his first day of school, expressed through his "Blue Recess Period" (Picasso-inspired) drawings. 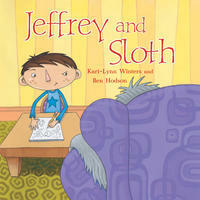 In Jeffrey and Sloth, by Kari-Lynn Winters, illustrated by Ben Hodson, Jeffrey's having trouble writing. Should he start with pictures or words? He draws a sloth, who distracts him until he gets an idea, writing the sloth into an active cross-Canada search for a blanket. This one emboldens children to turn doodles into a narrative. 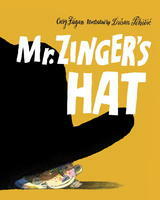 In Mr. Zinger's Hat, by Cary Fagan, playfully illustrated by Dusan Petricic, Leo meets Mr. Zinger, the old man who walks the courtyard, the one with the dark suit who looks like an elf. When Mr. Zinger's hat blows off and lands on Leo's head Mr. Zinger says there's something inside...a story. One which Leo and Mr. Zinger create together with Leo providing a simple, perfect plot solution. It turns out Mr. Zinger is a writer and after he heads home to write, Leo is inspired to create his own tale. 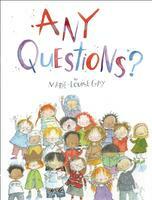 The voice in Any Questions?, by Marie Louise Gay, is first-person Gay. She's test-driving a story, making decisions in full colour with her little characters contributing ideas, i.e. What if the paper were sea-blue? Gay writes out ideas, makes changes, deletes words, until suddenly she knows what the adventure will be about. A story within the story unfolds: "The Shy Young Giant." Gay stops to brainstorm with her illustrated kids about what will happen next, modelling the true writing process in a most kid-friendly way. In this uproarious sequel to Chester, the battle of the picture-book makers continues. 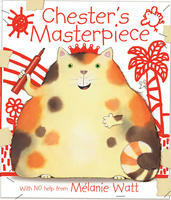 Which author-illustrator will come out on top --- Chester or Mélanie Watt --- is anybody's guess!